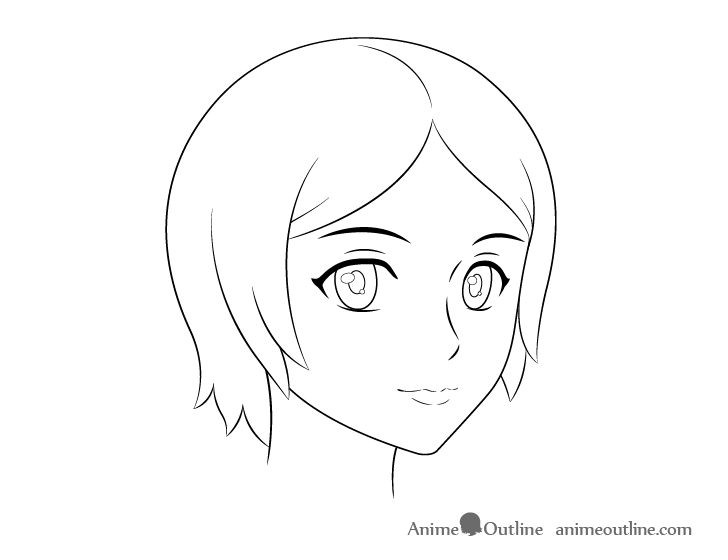 This tutorial explains how to draw an anime or manga style female face in 3/4 view with step by step illustrated examples. 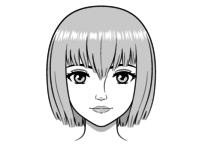 This tutorial uses a slightly more realistic style with a better defined nose and lips. Though this is less common in anime it will allow you to better see the placement of the facial features. If you are going to be following along drawing on paper be sure to make very light lines for the initial steps of the drawing as you will have to do some erasing later. 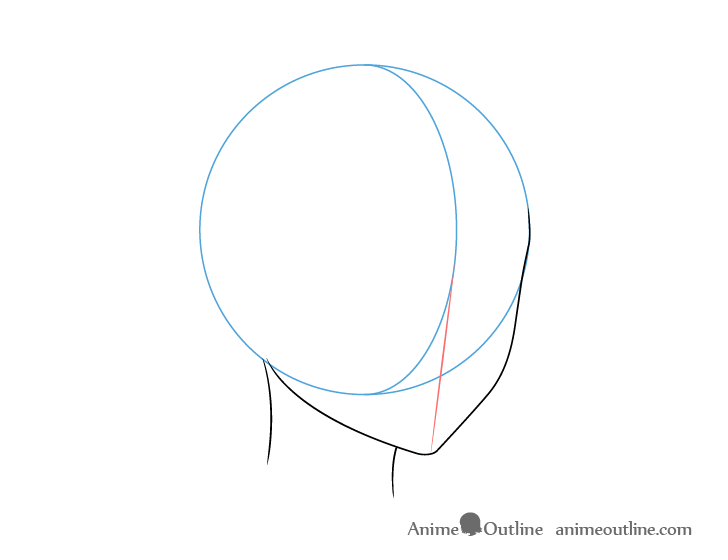 Start by drawing a circle for the top part of the head. Now think of the circle as a sphere and through this sphere draw a line that will determine the middle of the head. 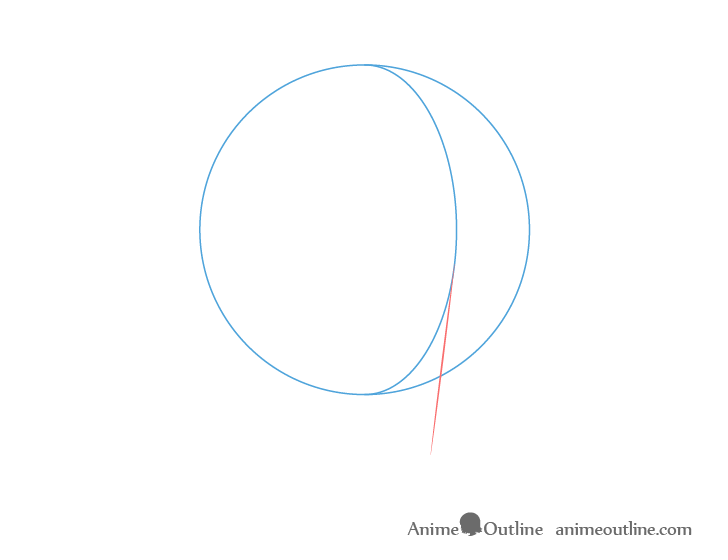 This line will curve around the sphere sort of like if you were to tie a string around a ball and look at it from the same angle at which you want to draw the face. If you were to look directly at the string from the front it would be a straight line but as you turn the ball the string would become a curve. 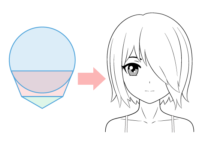 It can be helpful to first draw the line all the way around (making an oval) like the sphere is transparent and erase the hidden part afterwards. This way you will be less likely to make a mistake in drawing the curve. From the center line of the sphere project a straight line that is slightly angled inwards (towards center of the sphere). 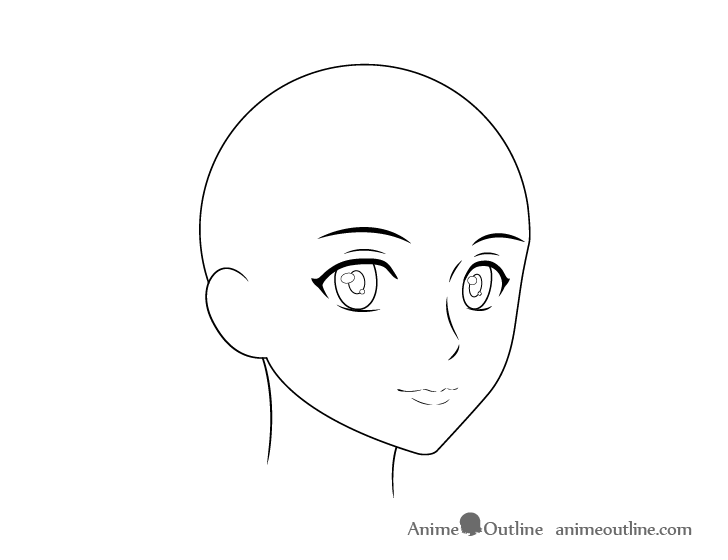 This line will be the middle of the lower part of the face. Draw the sides of the bottom part of the face by adding lines going from the sphere to the bottom of the center line. It’s important to note that the proportions given above are based on the center line for all of the facial features (ears excluded). The reason to be aware of this is that the parts of the face that are closer to the viewer should be drawn slightly larger than the parts that are away. This is due to perspective. 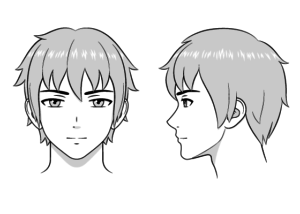 Also keep in mind that the “far” eye, eyebrow, and side of the lips should be drawn vertically shorter than their closer counterparts. This is both due to them being smaller because of perspective and because of the curve of the head. The far eye, eyebrow and side of the lips will curve away from the viewer and should be drawn vertically “compressed”. 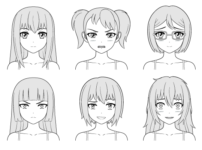 The more the face is turned from the viewer the more compressed you should draw the “far side” facial features. Draw the ear about as tall as a quarter of the face positioned between the top of the eyes and the bottom of the nose. Normally you can think of the hair as being split into the front, sides, and top/back. For this particular stile there is really not much to the “front” side to the hair as it is combed to each side and overlapped by the sideburns hair. 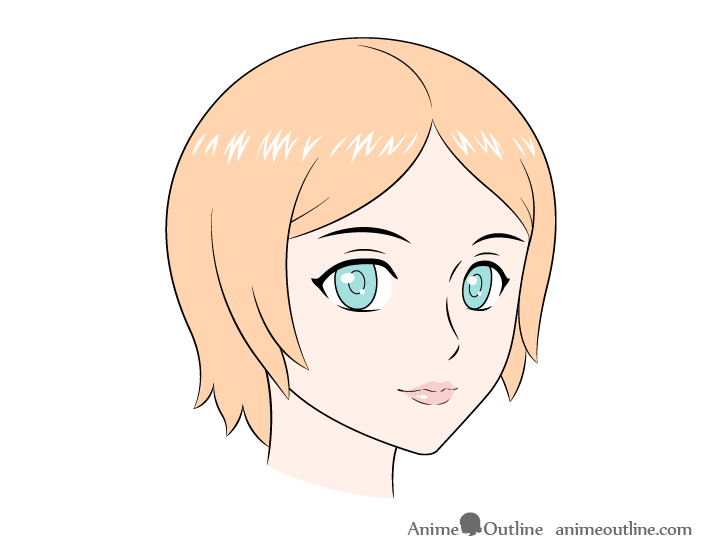 To draw this particular hairstyle you can pretty much trace the top part of the hair along the shape of the the top of the head but a slight distance away. As it curves downwards it hang downwards until the ends. Draw the ends of the hair splitting into little clumps towards the back and curving away form the head. For the sideburns hair make them curve slightly inwards towards the face. 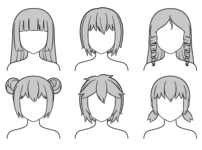 At this point you can remove any of the construction lines from your drawing and erase any parts hidden by the hair. You should have a clean line drawing after you are done. For this step simply fill in each area with the appropriate color. If you are coloring on paper then leave the highlight areas of the hair and the reflections in the eyes white. If coloring digitally add them in at the very end. 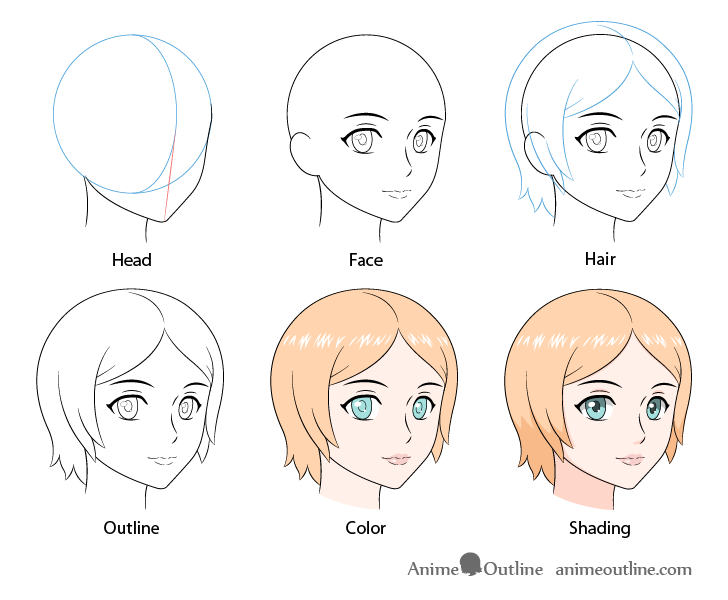 As in many other tutorials here on AnimeOutline for this particular drawing we will simply shade the areas that tend to have shadow in common lighting conditions with the light coming from above. 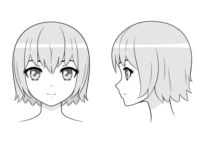 As already mentioned this particular example shows some slightly more realistic facial features but the same steps can be applied to drawing a more traditional looking anime character. 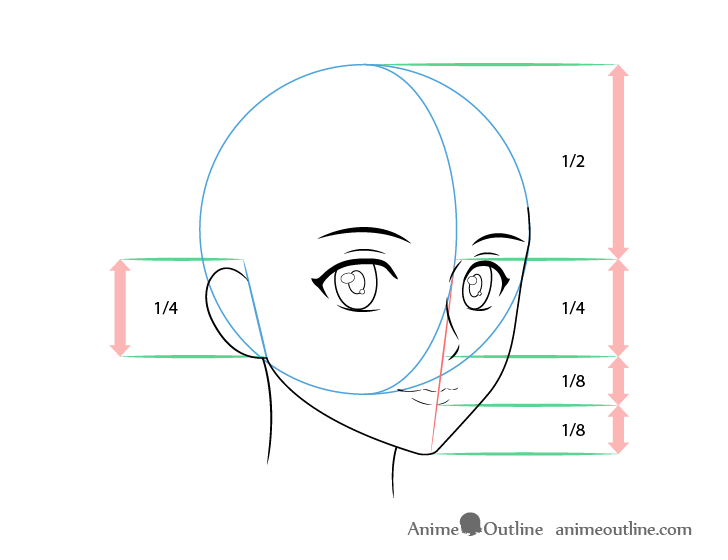 Also keep in mind that the proportions used in this tutorial are just recommendations and can change based on variations in the style.